Although voters passed referendums legalizing recreational marijuana in California and Massachusetts in November, regulators at the state and local level are still working out how to manage the new industry. One of the key areas has been finance–a potential point of conflict between the federal and state governments. The Treasury Department reports that out of the 12,000 banks in the U.S., only 368 serve the cannabis industry. Now, the city of Los Angeles is considering becoming one of them by creating a municipal bank to serve the cannabis industry and the city’s needs for housing and other services. Earlier this summer, Los Angeles City Council President Herb Wesson introduced the idea of a municipal bank in a speech that, among other points, laid out his agenda for battling racism and addressing a housing shortage. One way to push the envelope would be to get the city involved in banking and loans to California’s cannabis industry, a project that Wesson hopes would be able to help the city fund housing projects. In California, the cannabis industry has welcomed the idea. The proposal draws attention to a longstanding hindrance the industry has faced. The lack of access to traditional financial institutions affects both the expansion prospects and physical safety of marijuana businesses. Many of them operate with large amounts of cash, which has made them targets for robberies. At the same time, acquiring financing for expansion has proven difficult, since federal laws restrict the loans that banks can give. Since cannabis remains illegal under federal law, banks protected by the FDIC are required to inform federal authorities if they suspect that customers are involved in illegal activity. The stakes for failing to report are high. If they do not report suspected illegal activity, the FDIC could step in and force the bank to close. This is enough to make cannabis loans fraught with peril for financial institutions. The situation is not much better for borrowers. Not only are traditional financial institutions accountable to federal regulators, borrowers have fewer legal protections. Under the standard terms of a mortgage agreement, a bank can “call” the loan and demand that the borrower produce the balance due if the property is being used to conduct illegal activity. Since cannabis remains a controlled substance under federal law, any business selling cannabis for recreational or medical consumption is at risk. As a result, cannabusiness has often turned to credit unions or private loans for financing. Frequently, these businesses are also pushed into loan terms that would be considered draconian in other industries. Municipal banking is becoming a more attractive option to local officials in California. After the passage of legalization in November, the state of California convened a working group led by the state treasurer to look at options for providing financing to the industry. In July, the city of Oakland also began to consider municipal banking. While supporters of public banking do not always mention cannabis in their proposals, supporting the industry is often one of their considerations. 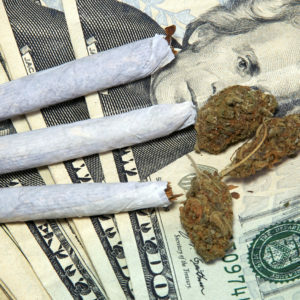 “[Marijuana-related business] banking has been on the radar of the public banking movement before, but many of our earlier assumptions were naïve concerning how cleanly a state-only cannabis economy could break free of federal banking oversight,” said Matt Stannard, policy director of Commonomics USA, a group pushing for both public banking and economic justice. State lawmakers are still considering the workability of these proposals. Despite the lofty principals, the day to day operation of a large bank could be difficult for the city to manage. Although the idea of a municipal bank has been floated on numerous occasions, there are few domestic examples of it.